Whether you are teaching or promoting your cake business, chances are you will end up in front of a live camera giving a demonstration. When you film a food segment it presents its own set of circumstances that you have to be prepared to work with. Like camera angles, being prepared to change cameras or stop and start again, or controlling noise and background distractions. Also, working in a studio on a green screen-don’t wear any green, blue, or metallic colors and your cake, desserts or tools can’t be in those colors either or they will disappear! I’ve had the opportunity to film a few segments for the local Today in Brevard Lifestyles Show, one with Chris Kridler on location and three with producer and video journalist, Caroline Perez, in the studio. They both have taught me a lot. It’s a fascinating world in video journalism and Caroline was happy to fill us in with some information and helpful tips for you when you find yourself being invited to guest on a food segment or demo on camera at your next ICES Day of Sharing. Caroline produces a weekly 27-minute Lifestyle Show. She plans the show budget, edits and/or shoots the video segments, coordinates centerpiece studio guest(s), writes scripts when needed and shoots on location or in their TV studio. 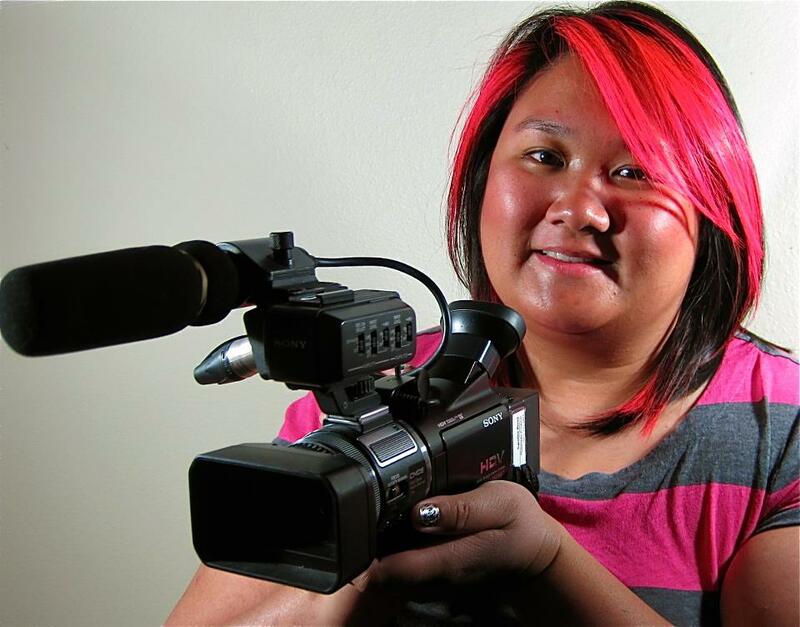 Sidney–How did you get interested in video journalism? Caroline-Back in early 2000s when I was going to San Francisco State University for journalism, I was studying news writing. Each student is supposed to spend at least two semesters on the student publications. I worked on the newspaper and online newspaper. Back then, we were making audio slide shows with Flash. We didn’t learn video. I didn’t learn how to shoot video until I came to FLORIDA TODAY (Newspaper). However, I do remember when I was a freshman or sophomore in high school, I interviewed my little cousin on cassette tape (remember those?). You could say I got my journalism practice early. Sidney–Did school prepare you for the real world? Caroline-Yes and no. Yes because that’s where I learned the basics and foundation of journalism. No because technology has changed so much since 2005, when I graduated. The way we consume news affects how we produce the news products. However, there are always tools that never change and are always taught, such as ethics, reporting in a fair and unbalanced manner, how to gather facts, etc. Sidney–What are the pressures of producing a weekly show? And how far in advance do you shoot? Caroline-I can shoot as much at 2-3 weeks in advance or two days before the Lifestyles show is due. The videos come from various sources (either I shoot videos, another visual journalist, possibly a freelancer or file videos). Additionally, the show host will write a script (sometimes I write it) and read it off a teleprompter. The host also does a centerpiece interview in the studio. Those interviews can be long (longer than 4 min). It’s a lot of multitasking. The main pressure is I have to keep track of where all the videos will come from, estimate how long the video segments will be and if I come up short, figure out a way to fill the time. We generally do not have standalone videos ready on standby to be used. For the newspaper, there are wire stories that can be used to fill space. On a TV show, it needs content, so I’m constantly checking to see how much video I will have and if I need to shoot anything during the week. Sidney–Is it easier to film in the studio vs. on location so you can control your environment? Caroline-It’s a little easier to shoot in the studio, but it takes just as long as shooting on location. Either way, I have to think about lighting, sound and making mental notes of what to film so I can edit. In a traditional studio, there is someone working controls for audio, for the cameras, several camera people at each camera and a director calling the shots. In our studio, I am often doing all those roles in one taping. Sometimes a coworker will help out and we’ll divide the duties. Sidney–You have the opportunity to film many food segments, has anything ever gone completely wrong while filming? Sidney–What were your most complicated/hardest shoots? Caroline-We occasionally live stream video events. Unlike TV camera people, when I stream video live, I set up my camera on my tripod, set up our laptop on my tripod, set up our internet and microphones. TV camera people can leave their tripod, whereas I am tethered to my equipment (which should be plugged in to an outlet). Even with a promise of internet, something can always go wrong with a live shoot. Also, sometimes folks tense up in the studio. It could take longer to film on location because of setting up lights, audio, the “set,” etc. Sidney-What were a few of your most exciting/enjoyable shoots? Caroline-I shoot video for all sections. I’m not tied to a specific beat, but I mainly shoot features. I used to shoot Metromix entertainment videos featuring restaurants and bars. People would always say, “You get to eat and drink for your job? How exciting!” We don’t do those kinds of videos anymore. Most recently, a reporter and I sailed the newest Disney ship, the Disney Fantasy last month. We went on a three night media preview cruise to the Bahamas and back. Let me tell you, the dining service was stellar and the food was amazing. The reporter even interviewed the Manager of Food Standards for Disney Cruise Line. The desserts included: Tahitian Vanilla Crème Brulee, Steamed Lemon Buttermilk Pudding with Citrus Reduction and Grand Marnier Soufflé infused with fresh Orange Zest and served with Crème Anglaise, to name a few. Sidney–What tips and tricks would you give your guests to make filming a food segment easier for you and for them? Caroline-One word: preparation! If there’s food that can be washed, cut, wrapped — any little thing that can be done ahead of time — it will make for a smoother filming process. You see it on morning talk shows or cooking shows all the time. The chef tells you what to do and cut to “ta-da!” there’s an example already pre-made. – Practice saying what you will say as you are demonstrating. – Do a quick run through with the camera people so they can get an idea of where to move the camera to match you. – In terms of taping, remember to face your actions toward the camera. For example, if you normally cut something in front of you, practice cutting it to the side (or just have it pre-made). Happy Summer Everyone! I hope everyone had a wonderful and relaxing Memorial Weekend! We rested and are ready to get back to work. On Monday, June 4 we will be making Summer Treats on the local news show, Today in Brevard. 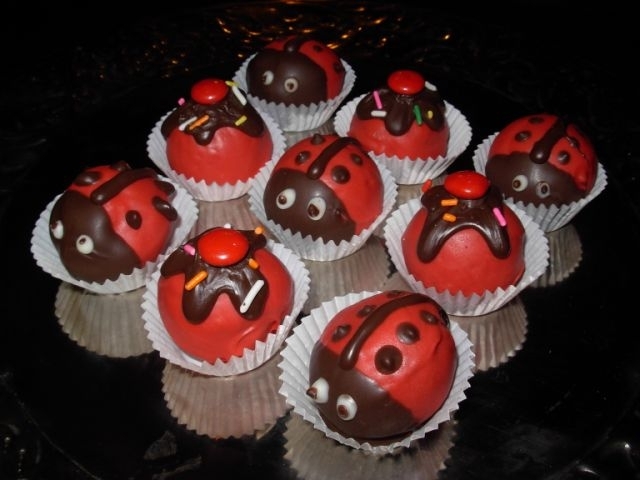 Tune in to see how to make cute little lady bug and ice cream social cake truffles. It airs 11:30am, 4:30pm, and 10pm on WBCC-TV and a live video stream at 11:30am at www.floridatoday.com and then runs in their video section starting Tuesday. Thank you to Producer Caroline Perez, Host Luann Manderville, and Cameraman Breuce for inviting me back for a third segment in the studio. It has been great fun working with you all! And watch for my blog in the next few days with an interview with producer Caroline Perez talking about video journalism and helpful hints on preparing and filming a good food segment. We have updated our website, so please check out all the new tutorials and videos we posted along with our new class list. We are updating the store as well. We’ll have the Water Lily Video and matching Molding Kit available very soon. Please check back often for updates and new tutorials. Nov 11&12-Tami Utely returns to Simi Cakes! We would like to thank our good friend, Certified Master Sugar Artist Ruth Rickey, for offering the tip(s) of the week for us. Ruth is very creative with color and now has her own line of petal and luster dusts. Yesterday, Ruth was guest speaker on www.cakefu.com and did an entire presentation on dusting leaves. You can see it here: http://www.cakefu.com/masters-series/ruth-rickey-23/ . She gave a special discount price on her dusts for the CakeFu attendees and is now extending the discount to Simi Cake readers until Monday. You get all 25 petal dusts and 10 luster dusts for $100. You can find the dusts and her class schedule on her website: http://www.ruthrickey.com/ And check out her blog Sugar Zen at: http://sugarzen.wordpress.com/ for cake decorators. Today I have an interview for you that I did with Rafael Logrono of “Rafael Logrono Cake Design”. He is a young baker, like me, who owns a bakery in Philadelphia, PA. We met through twitter and recently got to meet face to face in Virginia at the National Capitol Area Cake Show where we played with sugar bubbles. Rafael specializes in wedding cakes, but he also teaches classes in Philadelphia and beyond. He has a great smile, great sense of humor, and creates the most beautiful cakes. He has been featured in Cake Central Magazine and The East Coast Bride to name a few. I cannot wait until we meet again at the Sweet Treats Cake Competition in New Jersey in September! Enjoy! Sidney: What kind of training have you had? Rafael: With the exception of a few hours of instruction, I am self taught. I was (much) younger when I began showing an interest in cake designing so traveling and learning was tough. Sidney: How old were you when you first started cakes? Rafael: I am 18 now, but I began about 6-7 years ago. I grew more passionate about 3 years ago and took it more seriously. Sidney: What do you think are the advantages and disadvantages of being young baker? Rafael: This is a question I get asked often! Let’s start with the disadvantage first; when people find out my age, they think of this as a phase or a hobby for me, but once I tend to prove them wrong. One of the advantages to this is that since I am young, I find that I am more cutting edge and can offer my clients something different than what they are accustom to. Sidney: What are your personal favorite themes and colors for cakes? Rafael: As of themes, I enjoy anything that allows to be creative. Some of my personal favorite colors are carolina blue, olive green and raspberry red, mostly food related! I personally love wedding cakes! Wedding cakes make me strive for perfection, making me a more disciplined person. Sidney: How did you invent your beautiful bows? Rafael: Ha! I bet I didn’t invent them, but they’re one of those things that you practice and make tons of, until you get them just right. Sidney: What was your first amazing bow used on? Rafael: You are flirting with my bows! I don’t remember what cake it was used on, but I do remember it being ugly! Sidney: I know you have a great support system like I do, what’s a typical day like working with your mom? Rafael: I have an awesome support system in my parents and would not be able to do what I do without them. Working with my mom makes for an interesting dynamic. The business is under her name, so she can fire me at any time. Ha! Sidney: You have a great sense of humor, how do you use that to your advantage in your business? Rafael: I do?!? I am always very kind and charming, so I guess it comes naturally to everyone. I do use my good looks to get what I want though (there goes my sense of humor)! Sidney: What means of marketing and advertising do you use? Rafael: Marketing is so tough! I wish I knew more about marketing and advertising before beginning the business. You’ve probably heard this before, but social networking is amazing. Having a website, blog, Facebook page, twitter account is very important in today’s society. Just by a simple google search, clients and colleagues can get familiar with your work. This brings me to my second point, your work speaks for itself. Working hard isn’t enough anymore, you have to go above and beyond since there are so many people in this industry. Sidney: What are your plans for the future? Sidney: You can’t always work! What do you do in your spare time? Rafael: Spare time? What’s that? In my spare time I like to work out, dance and cook. Also, there are certain TV shows that I have to watch: Glee, Smash, Modern Family, Ellen and a few reality shows… I am excited for the new season of Dancing with the Stars too… I am an avid fan of wrestling too, not many people know that! Stay tuned for my next blog post with Video Journalist, Caroline Perez! I am so excited I got to do an interview with the very talented Lisa Menz, founder, chairwomen, and organizer of the fabulous Florida ICED Cake Competition in Ocala, Fl, along with making her own cakes and teaching classes. I have known Lisa for a few years though FLICES and other events and classes around Florida. Last year we were a vendor for the show and this year we are the Outreach Liaison (we spread the word) for this Masquerade Ball themed competition. During the show there will be many demo classes, vendors, a kids corner and even a live challenge just to name a few, so it’s sure to be tons of fun. Sidney- How long have you been cake decorating and how did you get interested? Lisa– I have been cake decorating professionally for 18 years. I was always artistic, as a child. I would rather be drawing then doing my homework. Then when I got married, I was trying to find someone to do my wedding cake, other then a traditional cake. At that time I couldn’t fine anyone. I didn’t know where to look. I did not like my wedding cake at all & told myself, I can do this and I started taking classes, and then moved on to Mini- classes & Conventions, to learn my art from the best. I always loved to learn new techniques. Sidney- How did you decide to start the Florida ICED Cake Competition? Lisa– ICED was started by a conversation at Florida Mini-classes with Grace Jones. I always wondered whyFlorida didn’t have a big show. We have some of the most talented cake decorators, right here in our backyard. So I said I was going to do it and then Melanie Judge said she wanted to be part of the Co-chairing on the show. It took off from there. Sidney-Did you have any idea it would be such a huge success? Lisa-We knew people were hungry for a good show & excited to have it here inFlorida. Really we thought it would be well attended, but we were really stunted and excited when we got the turn-out we did. We were not expecting that huge of a turn-out of people, but glad it happened. It just showed us, how much people really wanted it. Sidney- How did you come up with the Masquerade theme for this years event? Lisa– We made out themes to be voted on by the people attending the 2011 show. Masquerade Ball was my theme idea. When it won, it was the best! I knew it would make for a great theme. Bright, festive, colorful. Sidney– What should we look forward to seeing at the Florida ICED Cake Competition this year? Lisa- We have tried to add so much to the 2012 show, so everyone feels included and not left out. We wanted all ages & levels of your profession to have a place to come and not be intimidated to compete. We have great demo class teachers, judges (local & judges from Ultimate Cake Off), sponsorship (big prizes), vendors, Kid’s Corner, Live Challenge contest. We most of all want everyone to look forward to having fun and making new friends and learning. This show is for all. Decorators & spectators as well. Sidney– You have some incredible sponsors this year along with great prizes! Tell us a little about them. Lisa– Wow, where do I start? We have so many top awards. Some of the ones I will mention are a Cruise by Icing on the Cake. Marivi Bassabe is giving away 2- individual mentoring packages to Overall-Youth division winner & The Shelley Robert’s Award ( both worth over $800.00 per). A Kitchen Aid for Overall People Choice Winner. A $600.00 Wilton Student package from Simi’s Cakes & Confections. The list is long of all the amazing prizes that have been donated to the winner’s & the raffle table charity cause. Sidney- It seems that the Florida ICED is a year round job; do you have time to work on your own cake projects? Lisa– (Laughing)- This is a great question! Most of the time ICED has consumed me for 2 years. You finish one show and then it’s off to planning the next one. ICED or any major event is so much work and time. It does cost me sometimes with taking wedding cakes, or wanting to go teach others & wanting to take classes for myself to improve & keep up with my art. I try to fit it all in. It does get hard to do. Sidney– I know the wonderful girls from the Ocala Cake Club are volunteering their time, but Florida ICED wouldn’t run without a great deal of help. What volunteer positions are still available and why volunteer their time? Lisa– I have to say volunteers & committee persons are very important key to ICED. No show is ever great without the help of many. As far as positions needed still? We need some more for the demo class areas. You will get to sit in for free in these classes if you help in this area. Also contact our Volunteer coordinator Kristin Nast, for all position available. KNast7@gmail.com Plus you get free shirts, masks, beads & some goodies from our sponsors & free entry into the show. Sidney– What themes are you considering for next year? Lisa– We will have a place to drop your votes for next year for our 2013 theme. Some that we have come up with are, Paris Couture, Greek Mythology, Purses & Shoes, Child’s World, Tropical Florida. So it will provide us with another exciting and creative year, depending on how the votes go. The Florida ICED Cake Competition will be March 30 and April 1 at the Circle Square Cultural Center in Ocala, Fl. Make sure to get your registration forms in as soon as possible for a spot to compete and to secure a seat in the demo classes! You can find out more and download the registration forms at www.floridaiced.com . Here is a link to Lisa’s website, http://cakesbylisa.net/, and for more information on the Ocala Cake Club email OcalaCakeClub@gmail.com. We will be at the show vendoring, teaching, and judging, so please stop by and say “Hi”!! Happy New year! My new years resolution this year was to blog more. I decided that with all the traveling I do I would interview some of the fantastic and talented people I have met, as well as share my experiences on the road and in the bakery with you! Sidney- What’s your favorite flavor? Christine-To make or to eat? lol I enjoy making new flavors. Also, baking coconut and lemon cakes are fun because the batter smells so good. 🙂 My favorite thing to make, though, is actually Italian Buttercream. I love the way it comes together at the end– it’s like magic every time when it whips together. Sidney- What brought you to the idea to make your own tv show? Christine-The show idea was something I’ve had in the back of my mind for a while now. A good friend of mine, who was –and sometimes still is– a cameraman for Cake Boss, and I tossed around the idea over dinner one night, and things sort-of took shape. Sidney– What are the hardest parts and the easiest parts about making your videos? Christine- The hardest part was getting all the logistics together (time, place, equipment, man power) and coming up with a script that we thought people would enjoy. The easiest part was being myself and teaching– something I love to do! Sidney- What do you have in mind for upcoming tutorials? Christine- I’d love to do more– one on making a small wedding/engagement cake.. a baby shower cake… holiday cakes… etc. I feel like people are really into cake decorating right now (see # of cake/cupcake shows on reality tv), but there’s not really a format on tv for showing people HOW to do it. I’d love to be the person who teaches people how to decorate and do other artistic things in their own homes/kitchens. Sidney– What’s your favorite medium to work with? Christine- I enjoy using fondant and painting on cakes with food coloring. At the moment, I don’t use as much gum paste and modeling chocolate as I use to. (I think much of that is because I currently do less sugar flowers than I use to, and I can use the fondant to sculpt.) As you know, I love pulled/blow sugar, but my set up right now is not great for it… (I don’t have a heat lamp) 😦 but soon I’d like to get back to that in a much bigger way. Sidney– What are your goals for 2012? Christine- I’d like to continue to spread the word about my business and see growth in my client base. I’d also like to do more wedding cakes. Sidney– What are your goals for the next 5 years? Sidney- How did working with Buddy the Cake Boss and Lauri Dutinno influence the direction of your cake decorating? Christine- Working at Buddy’s focused my attention on decorating, specifically fondant. He also taught me how to make dozens of sugar flowers. Working at Lauri’s made me realize that I had the tools, training, and confidence to run my own kitchen. Sidney– Who have been the biggest influences in your work? Christine- Buddy, his team, and all the girls I worked with at Carlo’s were the base of my knowledge and skills, but these days I’m mostly influenced by the talent of others in the world of cake decorating– I’m a big fan of photo sharing sites like Flickr and Pinterest. I am always browsing other people’s cakes, and am constantly in awe of everyone’s creativity. Online, I can see cakes from all over the world– as well as fashions, trends, etc.– which all influence me as a decorator. Sidney– Would you be interested in teaching more of your classes? And if so would you be willing to come to our classroom in Florida?? Don’t forget to check out her awesome instructional video!